These don't need an introduction, nor do they need any prelude. These are the flavors of my childhood, of pickled eggs on a buffet somewhere outside of Appalachia. Enjoy the eggs and the tang, the picnic fare, the last vestiges of light summer meals when you eat like a bird but perhaps not all that healthy. Enjoy it. Relax on your day off. This pickling method can be done in four hours. And even faster if you cook the eggs in a pressure cooker, like I did with REDMOND's multicooker. Sweet, earthy, and tangy, this recipe makes about two cups egg salad, enough for 4-6 tartines. Can easily double or triple recipe. If choosing to make hard-boiled eggs the old-fashioned way, go right ahead and skip to step two. If you're feeling adventurous and your pressure cooker is collecting dust, add minimal amount of water to cooker. In the steamer basket placed above the water, place eggs. Shut and cook on low pressure for six minutes. Release eggs into cold water and allow to cool to the touch to shell. In a saucepan, combine beets, liquid, white sugar, white vinegar, water and salt. Turn on medium-high and boil, stirring occasionally, until sugar is dissolved. Allow to cool. In a jar, place shelled eggs. Pour contents of saucepan over eggs. Add shallots, garlic, and peppercorns. Seal and place in fridge to pickle (minimum 4 hours). When waiting time is expired, drain eggs and slice or mash in a bowl. Finally, slice radishes and sprinkle over. 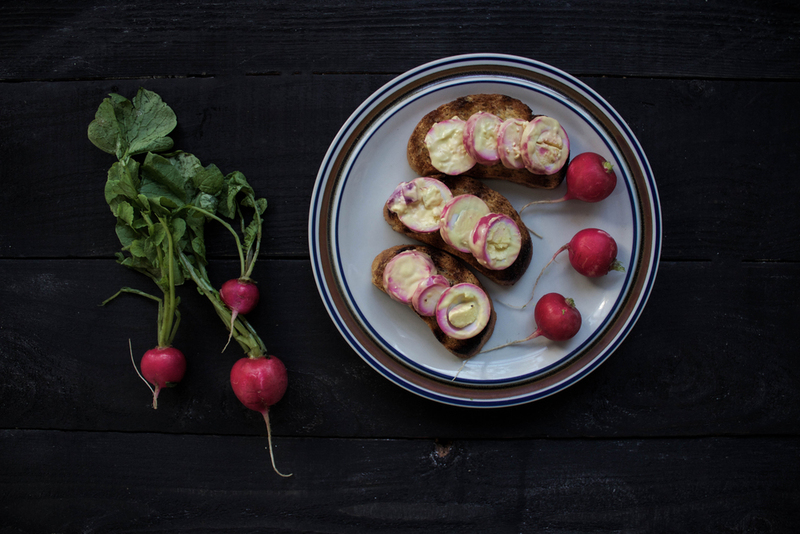 This is optional, but I liked the crunch and the pepperiness of the radishes. Note: For my bread, I cut a french loaf on the diagonal and oiled each side with a little bit of olive oil. Then, I heated the grill to a sear and toasted the bread on each side for 3 minutes or until slightly burnt on the edges.